Robinson, J. Lewis. "Fraser River Lowland". The Canadian Encyclopedia, 28 May 2018, Historica Canada. https://www.thecanadianencyclopedia.ca/en/article/fraser-river-lowland. Accessed 24 April 2019. The Lowland is the largest area of level land with suitable agricultural soils in coastal BC (Corel Professional Photos). The Fraser River Lowland is a triangular area in southwestern British Columbia at the mouth of that river. The eastern apex of the triangle is at Hope, about 160 km inland from the Strait of GEORGIA, and the lowland broadens to the west to a width of about 50 km. The international boundary between BC and Washington state crosses the southwestern part of the lowland. The COAST MTS form the northern boundary of the delta-lowland. 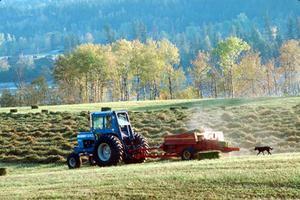 The lowland is the largest area of level land with suitable agricultural soils in coastal BC. The lowland is formed from both glacial and alluvial deposits laid down more than 10 000 years ago as a delta at the mouth of a much larger postglacial Fraser River. Following postglacial uplift of the land and erosion into the deposits by the modern FRASER R, the older delta deposits are now about 100 m above sea level. Lower-level lowlands, almost at sea level, are the result of recent alluvial deposition along the floodplain of present Fraser River channels and are protected from flooding by dikes. Dairy farming is typical on the alluvial soils of the lowest areas; the poorer soils of the postglacial, raised delta are used for small fruits, berries, poultry farming and forests. Known locally as the Lower Fraser Valley or the Lower Mainland, the lowland holds more than half of the population of BC, including on its northwest edge the city of VANCOUVER. Much of the western section of the delta-lowland has been occupied by the outward spread of residential, commercial and industrial land uses of Metropolitan Vancouver; in other parts of the lowland, agricultural land is protected from urban encroachment by zoning regulations. Indians occupied fishing sites near the mouth of the Fraser for a few thousand years before the establishment of FORT LANGLEY in 1827. Agricultural settlement came after the Fraser (1858) and Cariboo (1862) GOLD RUSHES, but the full agricultural use of the lower lands with better soils had to await improvements in drainage and diking early in the 20th century.